Looking for information about the Hang Bal? 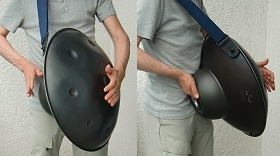 In August 2016 PANArt introduced the Hang® Bal. The instrument combines a modified Hang top shell with a Gubal bottom shell that has a Gu opening in the Gugel. It is worn with a shoulder strap which enables the player to move around freely with the instrument. Currently there isn't much information about the Hang Bal on the Internet. Here you will find information about the Hang Bal on PANArt's website.